With this in mind, lets take a closer look at fiber prices and how they affect not just the supply chain, but also the retail prices of garments. Whatever your goals and motivations, some of these conclusions may surprise you—and could even have you rethinking your marketing strategy. Because the focus is on fiber selection and the impact on fabric and garment costs, assumptions are made to make comparisons easy in order to identify trends. For instance, we are assuming processing costs are similar across fibers being compared. The fabric and garment constructions are also assumed to be the same. We also used a common 150 grams/meter2, single jersey fabric, pieced dyed solid in medium colors. Additionally, an 80% IMU on garment expense to calculate retail price was used. In the charts above, the green bars represent the percentage cost difference between fibers, while the blue bars represent garment cost differences in dollars and cents. 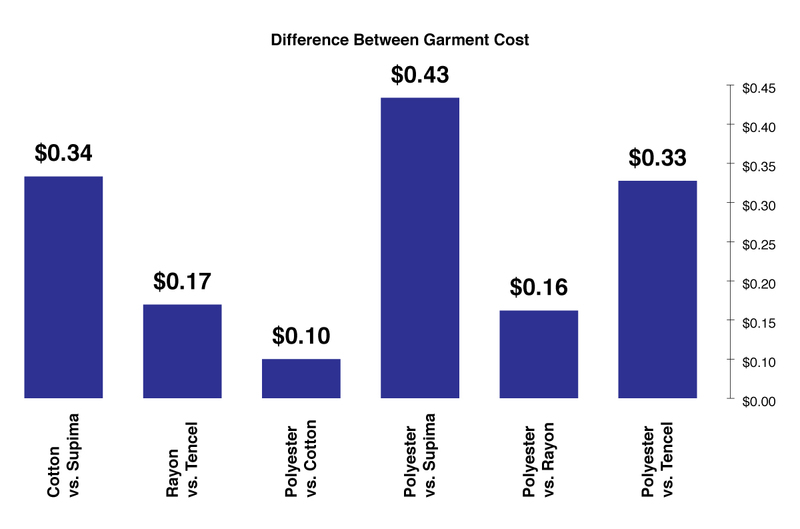 A closer look reveals that while fiber cost changes can be significant, garment price differences are unlikely to have huge impacts in many cases. For example, while lush, luxurious Supima cotton is 81% more expensive than regular cotton, the actual garment cost difference is only about $0.34. Similar inferences can be made when looking at the impact of fiber prices on garment costs and final retail pricing, below. 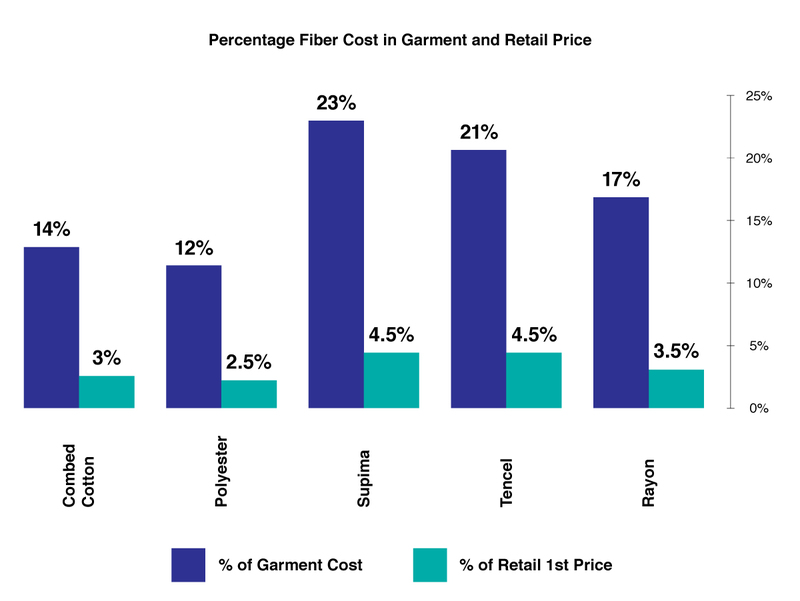 While differences in fiber prices may impact garment costs by about 13-29%, actual impacts on retailing pricing tend to be pretty insignificant – in most cases the impact at first-price retail is no more than 5%. Many consumers are willing to pay more for garments made from superior fabrics when the difference in value is properly communicated. Cost concerns often lead to knee-jerk substitutions. For example, it seems smart to replace cotton with polyester due to a $0.05 increase in cotton prices. But how does this help the bottom line? In many cases the quality of your fibers may have a huge impact on customer loyalty. Consumers are increasingly focused on value; properties including durability, longevity, and comfort are increasingly important to them. Focusing on higher-quality fibers can significantly improve these properties. Consumers may not understand that finer fibers mean greater softness, more shine, and better durability, while fiber strength helps to enhance a fabric’s performance—and all of these factors impact the consumer dramatically, particularly when it comes to the life of the garment. In many cases, products with higher-quality fibers are more comfortable and hold up longer, and can be sold at prices somewhat competitive with their lower-quality neighbors. Educating the consumer on the fabric’s quality—and the difference it can make in their long-term enjoyment of the garment—can be enough to convince them to pay a slightly higher price. “When you see both commodity and luxury fibers in the same area of the store, and at almost similar prices, that really means the retailer is losing the ability to communicate to the customer how much value goes into the product,” adds David. As the data shows, higher fiber prices may only make a small dent in the final retail price of a garment. In a retail environment increasingly driven by customer loyalty and consumers looking for long-lasting, high-quality products, better fibers can make all the difference. 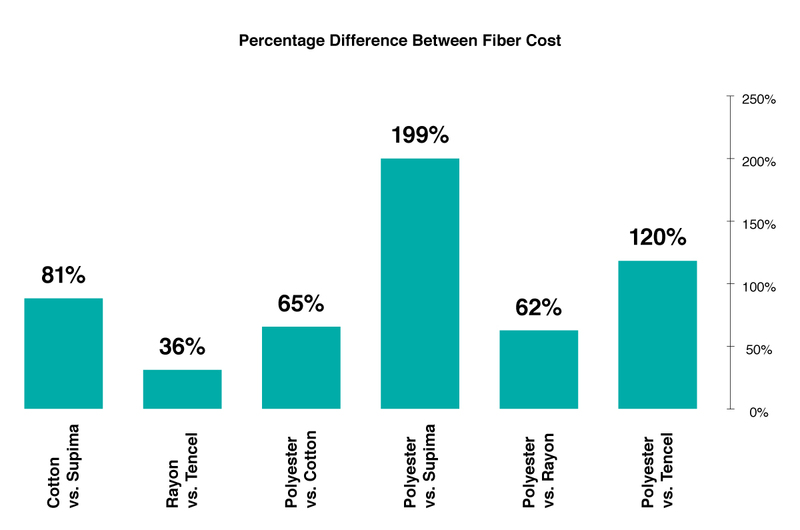 What’s more, fiber choices don’t just impact pricing—they can also affect your speed to market, as we’ve explored in a previous article. When you’re able to pre-position a handful of yarns and fabrics—and especially when you’re buying from American companies—you can build a faster, more responsive supply chain, putting your brand in a better position to compete in a world of affordable fast fashion.